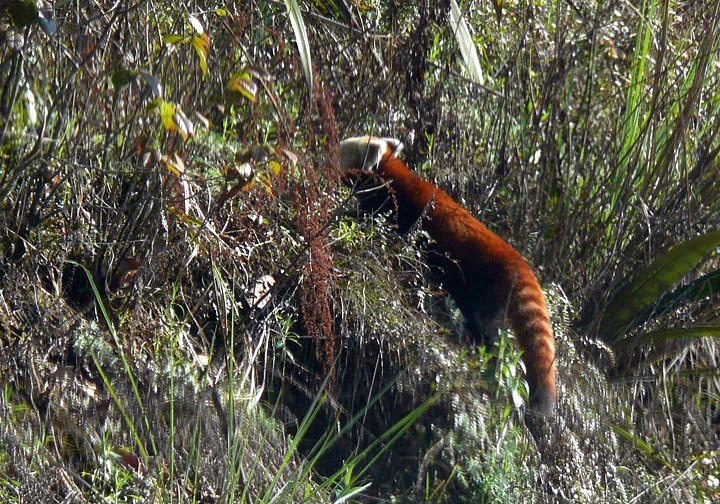 Red Panda, one of the most beautiful beings of the East Himalaya are fast losing its habitat. The extremely shy animal is extremely difficult to catch a sight of, except the drop of undisturbed nature at the tri-junction of Sikkim East, Darjeeling Hills of West Bengal and Tibet Chumbi Valley. Even if you get a glance, it is impossible to photograph the same. This impossible task has been done by Mousumi, a serious bird watcher, who also runs the site www.jalpaiguribirds.com, during her visit to the Silk Route. "I always love to explore the Neora Valley-Pangalakha area, a unique area of rich bio-diversity. In a sunny morning I was traveling through old Silk route, as a bird watcher I was busy in searching birds. 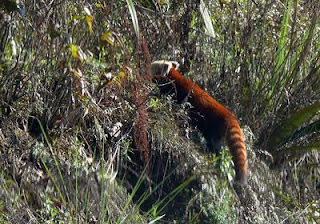 Suddenly after a narrow turn I discovered that the Red Panda, the one of the rarest animal was just in front of my car over the road. It took a few seconds to realize - yes it is there - and then I started shooting with my camera, I could not mange to get a very good shot but I am happy that I got the opportunity to shoot the animal in the wild".